In today’s complex, virtualized storage environments—often with a mix of on-premises systems and multiple clouds— it’s easy to lose track of what’s consuming your storage and, ultimately, if it’s even being used. 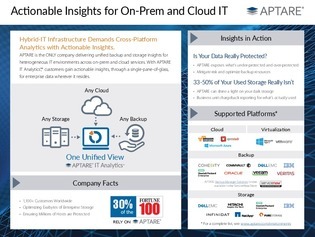 But what if you could examine the full end-to-end connectivity of utilized storage, track consumption trends to prevent unplanned outages, and meet compliance and corporate SLAs—all from one pane? Continue reading to learn how to achieve the above with a platform that delivers unified, analytics-informed backup and storage insights for heterogeneous environments. Your path to gaining actionable insights starts here.